Well, Thanksgiving was a pretty busy day. 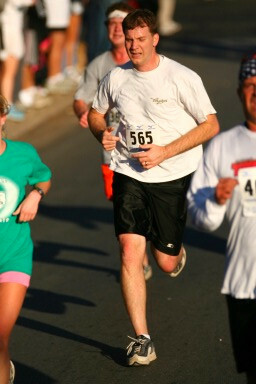 I started the day out by running the Fort Worth Turkey Trok 5K race. There were a ton of people running the race, so it was pretty crazy. I ended up running a 24:09, which is pretty good, but not quite what I was hoping to run. Still, it was good enough for 25th place in my age group (out of 120) and 227th place overall. (out of over 2,500) So I felt pretty good about it. Almost as soon as we got home, we started cooking dinner. The turkey went in the oven at 9:30, and we were pretty much busy the rest of the time until 2:00 when everything was finally ready. We had turkey, stuffing, mashed potatos and gravy, sweet potatos, asparagus, orange rolls and parker house rolls. And for dessert we had homemade berry pie and pumpkin pie. It was crazy good. Definitely one of the best Thanksgiving dinners I have ever had. You can check out some pictures of dinner here. Be sure to check out the pumpkin pie we made from real pumpkins.